It’s been a long, cold, wet winter. Harsh winter weather often leaves outdoor furniture in need of major cleaning. This is true whether stored in a garage or utility building or left outside, covered or uncovered. As you prepare for a long, relaxing summer on your porch, deck, patio, or back yard, you face the annual project of doing your best to make your furniture look new again. For those in warm climates, spring cleaning is here and these tips will benefit you as well. HGTV offers some suggestions that will make your task easier – or more successful. Here are some tips to assist you with the often dreaded project. The first step is to wipe away any loose materials with a cloth or soft brush. Wood, metal, plastic, or fabric may be sprayed down using a garden hose with a spray attachment. Once this is completed, you’ll know if further cleaning is required. Composite – Plastic and resin furniture is easiest to maintain. To keep from scuffing the surface, don’t use abrasives. Simply spray with an all-purpose cleaner and wipe down with a sponge or damp cloth. Then rinse and dry. Metal – Wrought iron and stainless steel are popular choices for outdoor furniture because of their durability and low maintenance. In most cases, metal patio furniture will easily return to “like new” condition. Just use a sponge or brush with a quarter cup of mild dish soap added to a gallon of warm water. If rust is detected, steel wool will remove oxidation. Then consider re-painting the furniture to prevent further rusting. 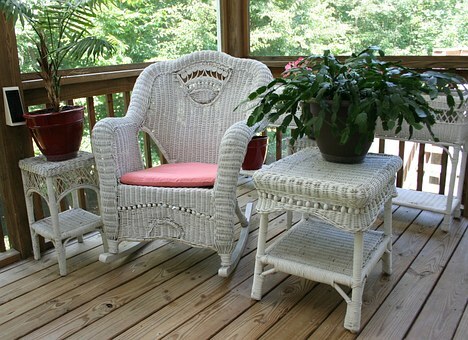 Wicker, Teak, and Other Wood – Though tempting, a power washer will likely scar or otherwise damage soft wood. Instead, use a mild oil soap or soapy water and a soft brush or sponge to remove any dirt. You might need a toothbrush to get into the weave of wicker furniture. This can be time-consuming; cleaning regularly to reduce build-up will lessen this chore. Hard woods like teak will clean up nicely with a weak solution of laundry detergent or one of the many commercial products available specifically for wood. Fabric – For hammocks and seat covers, consult manufacturer’s instructions for recommended cleaning methods. If unavailable, the safest method is to use a solution of dish soap and warm water. Once clean, consider applying a water-repellant fabric protector to minimize future staining. A Saturday afternoon well spent! Your outdoor furniture will be clean and ready to provide months of fun in the sun. If you bought any new outdoor furniture, be sure to add it to your home inventory or send the information in for an electronic update!